Reducing cultivation intensity increases work rates and reduces cultivation costs, according to one Yorkshire potato grower. Abby Kellett finds out more. Most potato growers could afford to cultivate at least 2.5cm (one inch) shallower, according to NIAB research scientist Mark Stalham, but one Yorkshire farmer has gone one step further. In the last decade, Andrew Wilson, of Brickyard Farm, Melton in Yorkshire, has made big changes to his cultivation strategy after trialling a number of different machines and techniques on the 376 hectares (930 acres) he operates across. As well as reducing the need for a bed tiller across much of his acreage, bed depth has been reduced to around 25cm (10in), much shallower than the national average. In doing so, he has reduced his cultivation costs by about 10 per cent, without suffering the yield reduction many growers fear. ‘Just in time’ ploughing was one of the first changes to be made. “We got better results from doing this because if we had a lot of rainfall, land did not have time to get wet underneath and we still had a dry till on the surface. With ‘just in time’ ploughing working well, Mr Wilson began to question some of the other cultivation practices which were in place, including the use of two single bed tillers. In purchasing a ‘cheap’ two-bed tiller, he was able to till immediately after the plough. The destoner then created ridges directly behind the tiller, eliminating the need for pre-ridging. In making the change, the 200hp tractor previously used for ridging, was instead doing the bed tilling as well as the ridging all in one pass, exploiting the horsepower of the machine. “My two little tillers and my two hire tractors were virtually redundant,” he says. Having established the system worked, Mr Wilson invested in a new single tiller and put the existing ridgers on the back, reducing the number of machines and the amount of passes required. Of the two remaining bed tillers, one was kept for tilling headlands and the other was used to upgrade his nematicide bed tiller. “We learnt over time incorporating the nematicide into the destoned bed before the planter was by far the best place for it. “Before this, in some instances we were going through the field with a deep bed tiller just to put nematicide on and we were over diluting it as a result. “For the tenner an acre it is costing me to do it, it is certainly paying me back,” he adds. 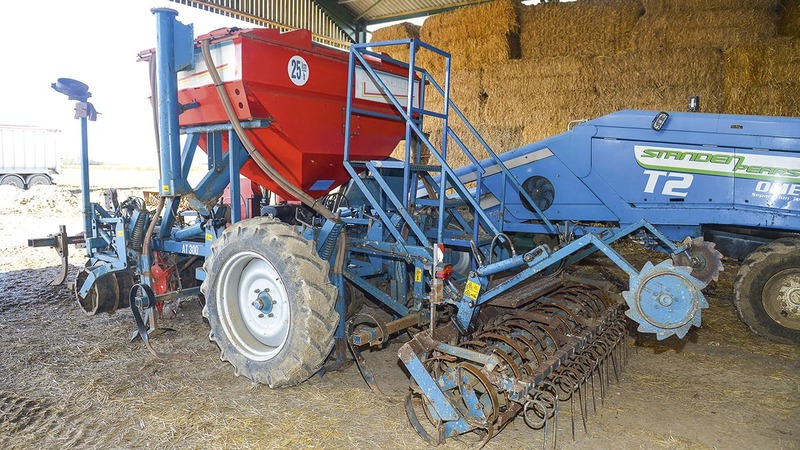 More recently, Mr Wilson invested in a heavily sprung, tined cultivator after being impressed with what a similar demo cultivator achieved on some of the farm’s heavier land in one particularly wet season. “We thought if we ploughed it, it was just going to turn over into wet slabs, so we went in with the cultivator instead at about seven inches deep. “It dried nicely over the next couple of days and when we did finally plough it, we found we were turning dry stuff down and wet stuff up. But because the wet stuff was only from around 4-5inches deep, it was quite friable and took a lot less drying because it was in smaller fragments. Following on from the success of the cultivator, he has now invested in a similar machine. Both are used extensively on-farm and in some cases, they are replacing the bed tiller, particularly on the lighter land. “In some instances we are still tilling, but we are going much faster because we are tilling straight into the ploughing, rather than into a preformed ridge. “Rather than the tiller being overloaded at either end and in the middle, it is evenly loaded across its width, making it easier to pull; so we can pull it quicker, with less power, less fuel and in less time. Consequently, destoners are traveling faster, smearing occurs less and so drainage and rooting is better, he says. Increasing the pitch of the destoner from 42mm to 44mm also helped increase the speed of the destoner and in some cases, slumping has been reduced as a result of coarser soil aggregates. Given seasonal variation, it is hard to say whether less intensive cultivations have raised potato yields, but Mr Wilson believes his land preparation costs have dropped by about 10 per cent. As a result of these changes, the potato beds are currently about 50mm (2in) shallower than they were previously. Looking ahead, Mr Wilson is keen to adjust ridging depth within fields, as there is significant variation in soil types across the farm. “We have some fields where only parts of it needs to be tilled. So the next step for us is to make the depth of the ridger, which is on the back of the bed tiller, hydraulically-controlled. “At the moment, if you lift the tiller out shallower, you get the ridgers out too far, so you are tilling it a bit deeper just to get the ridge deep enough in the better parts of the field. “On some land we would probably get away with running the ridgers deeper and the tiller hardly in at all where it barely needs tilling. If that is 50 per cent of the field, it would be a significant saving, but it is crucial to have the right man on the seat. Alongside his new cultivation techniques, Mr Wilson introduced cover crops in 2011, partly driven by a need to control black-grass at a time when his rotation on non-potato land consisted of continuous wheat. Since then, his rotation has become much more varied, with the inclusion of spring crops and legumes, which allows him to use a variety of chemistry against the black-grass. In using cover crops ahead of potatoes, he found improved soil structure was aiding cultivation. He now uses cover crops ahead of nearly half of his potato area. In order to get best results, he aims to kill-off the cover crop a week prior to planting. “We spray the cover crop off and rip it up with a cultivator, because one of the benefits of the cover crop is retaining the organic matter in the ridge. If you plough it down, it ends up at the bottom of the furrow. Although some growers strive for maximum ground cover when growing cover crops, Mr Wilson aims for a thinner canopy to encourage weed growth so they can be sprayed-off along with the cover crop. To minimise costs, he uses a mixture of home-grown seed and cheaper species. “Oats are more vigorous than barley and we already grow oats so we have a source of them without spending a fortune buying them. “Mustard is quite cheap and brings quite a bit to the table in terms of organic matter, plus it is quite deep rooting." 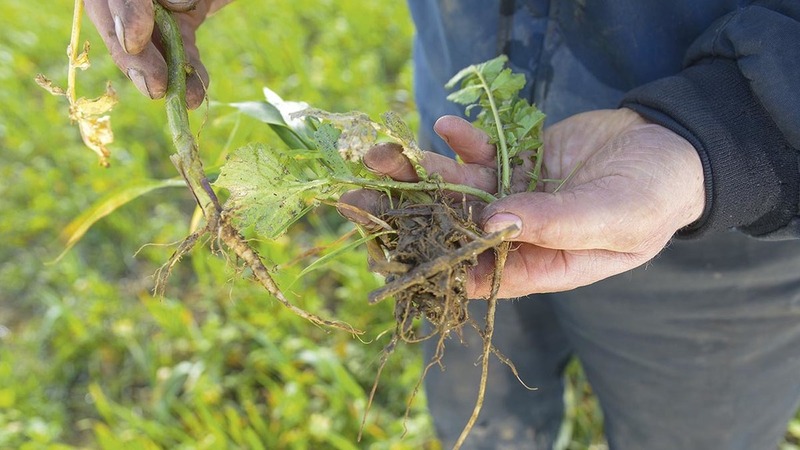 Given its alleged ability to reduce PCN populations in the soil, Mr Wilson will be experimenting with oil radish next season, in an attempt to reap further benefits from growing cover crops ahead of potatoes.